History has not been kind to Franz Ferdinand, or his wife, or their descendants, but I, and my co-author, Greg King, asked ourselves, “What is not to like about this man?” We wanted to put right his reputation, to paint a picture of the real man whose death sparked off the deaths of so many others. Commuting to work is one of those tedious facts of life that so many of us have to put up with and loathe. When I first left school, I landed myself a job in London. I was living at home with my parents in Kent and had to spend 2 hours a day on a train. To make this a bearable experience, I always made sure I had a book in my capacious handbag. One such book was Elizabeth Longford’s legendary biography of Queen Victoria. Queen Victoria had nine children, most of whom married into the Royal families of Europe. And then they, of course, had big families so there were Queen Victoria’s grandchildren ... then great grandchildren ... you’re getting the picture. I was instantly fascinated and started trying to find out more about all these offspring. From one book, a whole hobby materialised and a decade later I found myself totally submerged in nineteenth century European royalty with a particular fascination for the Habsburgs, the Austrian royal family. The astute amongst you are going to say, “hang on a moment, the Habsburgs weren’t closely related to Queen Victoria”. Quite right, but they had their own Queen Victoria (by which I mean a long reigning nineteenth century monarch) in the Emperor Franz Joseph of Austria. 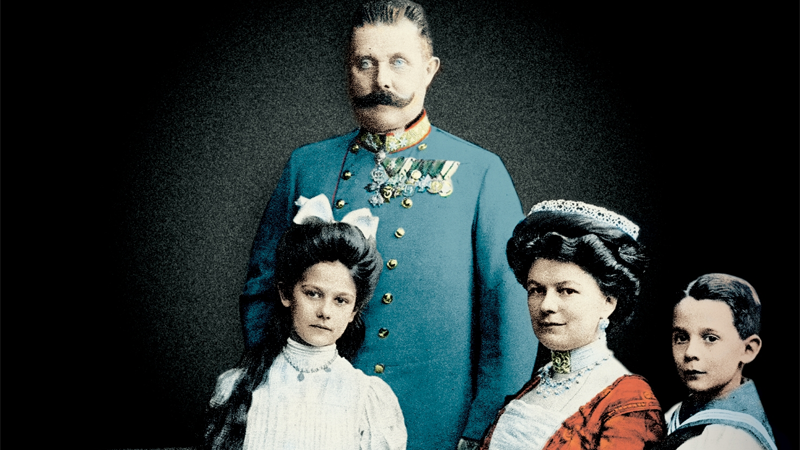 He wasn’t as flush with offspring as Victoria but his family was certainly interesting, and the teenage me was caught by the romantic image of his nephew and our book’s hero, the Archduke Franz Ferdinand. Franz Ferdinand was the awkward, quiet child of the family, overshadowed by a much more charming sibling. Due to various family tragedies, he shot from being a minor archduke to the heir to the throne. And then he fell in love with a woman of much lower social rank and fought tooth and nail to marry her. It’s almost a fairy tale, but sadly it did not have the happy ending - although Franz Ferdinand’s dying words were poignantly for his wife and children. History has not been kind to Franz Ferdinand, or his wife, or their descendants, but I, and my co-author, Greg King, asked ourselves, “What is not to like about this man?” We wanted to put right his reputation, to paint a picture of the real man whose death sparked off the deaths of so many others. History moves quickly from Franz Ferdinand’s murder to the causes of WW1. We have stopped the clock on this important event and pointed out that this is a tragedy of similar magnitude to the assassination of Nicholas II and his family in Ekaterinburg. It is very much the story of a family who lived through all the vicissitudes of the last century and are still dealing with the repercussions of it today. These days I still commute to work in London. And I still read avidly. There are many days when I look up and realise I have missed my stop because I am so engrossed in a book. I hope our book, The Assassination of the Archduke, takes you out of your zone!